Razor sharp out of the box with a piercing pin point tip, this big 15 inch survival knife is ready for action! Featuring a powder coat black finish, the 10 inch blade on this beauty can slice and dice with ease and has a silver edge. Contoured for a comfortable grip, the orange handle is made from durable ABS material with a rubber coating while the blade carries a silver biohazard symbol. 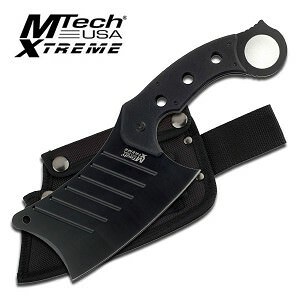 An ideal survival knife, it comes with a FREE nylon sheath and belt loop so you can always have it ready by your side.